Maybe our favorite week of the year just wrapped up—Noir City in Seattle! Our friend Eddie Muller (you know him, you love him, you may have seen us on his Turner Classic Movies show Noir Alley) and his Film Noir Foundation began this film festival over a decade ago. Seattle is fortunate enough to have its own satellite version mere weeks after the main event in San Francisco. We’ve been attending since the first Pacific Northwest fest in 2007, and our role has grown over the years; we started as fans, then volunteered to staff the FNF merchandise table, then Vince started writing for the foundation’s magazine (he’s now the managing editor), and today we occasionally join or stand in for Eddie on stage introducing the films. Noir City is dedicated to screening classic crime films in a theater, the way they were meant to be seen—with the proceeds going to restore more movies that can then be shown the same way. (Read more about the foundation’s mission here and please think about making a contribution.) This year’s line-up went even further toward recreating the feel of attending the movies in a bygone age. It paired a “classy” A-film with a “trashy” B-movie, every night’s double-bill advancing through the 1940s. In other words, heaven. Here are a few highlights from our jam-packed week. February 17. By day, big-screen Hitchcock (the Master of Suspense’s personal favorite of his films, Shadow of a Doubt) and a chance to revisit Address Unknown (1944), a shattering story of a German émigré who returns home and gets caught up in the rise of the Nazi Party, with director William Cameron Menzies making a virtue of his microscopic budget. By night, a perfect example of what the Film Noir Foundation does for movie history. In 1943, French filmmaker Julien Duvivier made the beguiling anthology Flesh and Fantasy with a host of big-name actors including Design for Dying featured player Barbara Stanwyck, Charles Boyer, and Edward G. Robinson. A fourth story was carved out of the film, awkwardly padded, and released the following year as Destiny. Noir City ran both films together; the San Francisco screening marked the first time they’d been shown jointly in a theater, and Eddie announced the FNF is already at work on reassembling them into a single feature as Duvivier intended. February 18. 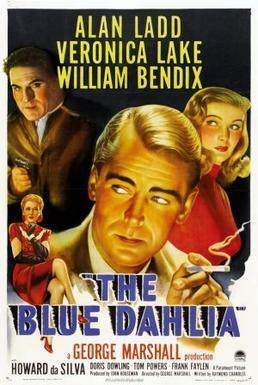 Eddie kindly asked us to help him introduce 1946’s The Blue Dahlia, the third pairing of Paramount’s brightest stars of the 1940s Alan Ladd and Veronica Lake. We talked about Edith Head’s costumes for the film and her role in maintaining Veronica Lake’s image for the better part of a decade. February 19. Our busiest day as we spelled Eddie introducing the matinee screenings. Many of those in attendance on this Presidents Day were at Noir City for the first time, and eager to see encore showings of two true American classics: The Maltese Falcon and Mildred Pierce. Luckily we’d just attended the opening night of a new stage adaptation of Falcon in the company of our friend Julie Rivett, who is not only a prominent Dashiell Hammett scholar but also his granddaughter. We were able to share some of her insights into her grandfather’s work. February 20. Back onstage with Eddie for a gorgeous new digital restoration of I Walk Alone (1948) from our friends at Paramount. This first teaming of Kirk Douglas and Burt Lancaster bridges two eras, Lancaster’s recently released hood a figure out of 1930s gangster films looking to square things with ex-partner Douglas, representing the corporate crime that took hold in the 1940s. The movie also boasts some fabulous Edith Head gowns; we later learned from Paramount’s archivists that the studio still possesses a Lizabeth Scott number we talked about. The B-movie that followed, 1948’s brisk Bodyguard, is an exemplar of the form—wild man Lawrence Tierney barrels his way through 62 minutes of mayhem from a story by Robert Altman earning his first screen credit! February 21. 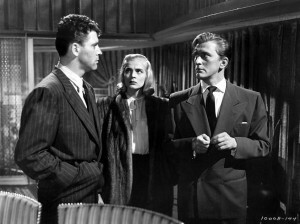 The true find of the festival was 1949’s The Accused, a movie with real resonance in the #MeToo moment. Based on a novel by June Truesdell and adapted by Ketti Frings, it’s about a college professor (Loretta Young) who kills an overly-amorous student in self-defense and, out of fear, conceals the crime—only to fall in love with the victim’s guardian (Robert Cummings). A wonderful reminder that the movies of the past regularly wrestled with issues that still bedevil us today. Featuring, we must point out, costumes by Edith Head. February 22. The festival closed with the Northwest premiere of the FNF’s latest restoration, the highly entertaining The Man Who Cheated Himself (1950). A tough San Francisco cop covers up his society squeeze’s murder of her husband—only to have his kid brother assigned to the case. Starring Lee J. Cobb and Jane Wyatt in the roles you never thought they’d play! Our thanks to Eddie, the redoubtable Daryl Sparks, the Film Noir Foundation, the Seattle International Film Festival, the staff at the Egyptian Theatre, and the big crowds that came out every night. We’re already counting the days until next year—although don’t be surprised if we turn up at one of the other Noir City festivals before then. They’re impossible to resist.